Picture Polish recently released four new collaboration shades, one addition to their opulence scatter holos, a new top coat and some treatments. I always love seeing the collaboration shades. It must be hard for collaborators to come up with both something they love, yet is still different from all the polishes Picture Polish has released so far. This polish definitely fits in that category. Autumn is a new collaboration from The Polishing Life. 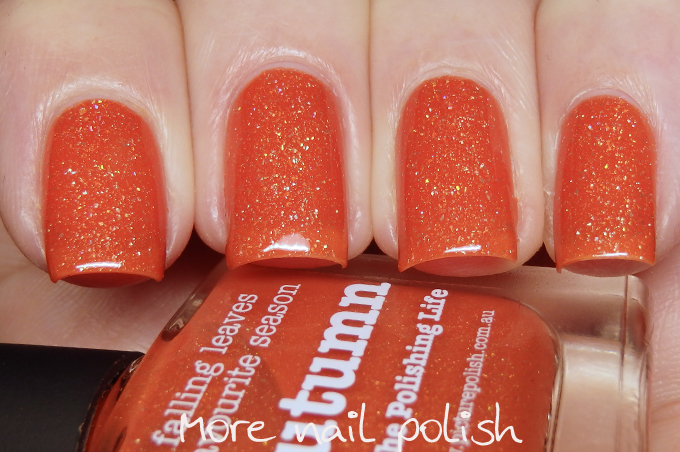 It is a bright orange jelly with a scattered holo effect. Its such a fabulous colour and one that I'm really glad someone wanted to create. Orange polish certainly isn't for everyone, but I think this one will get plenty of love (even outside of Halloween!). 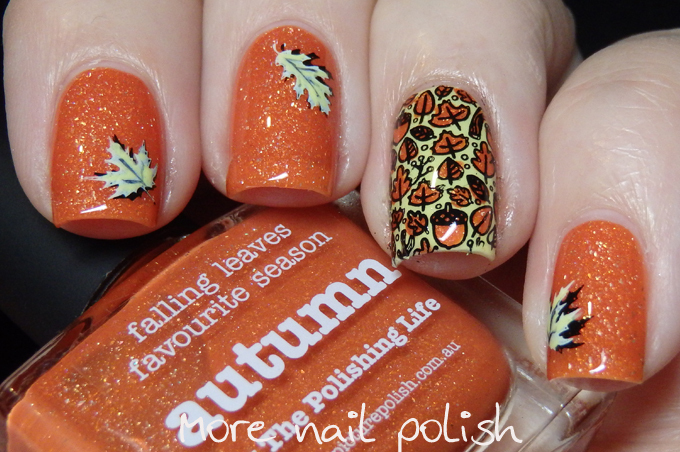 For my nail art look with Autumn, I couldn't go past some leaves. I used the images on Messy Mansion plate MM23. 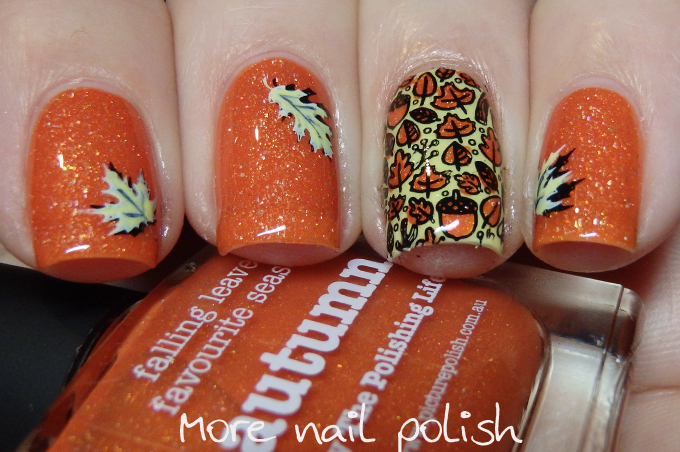 I created a decal on my ring finger using Autumn and black polish and put that over a base of Picture Polish Gelato. The individual leaf stamps on each finger were double stamped. First with black and then carefully with yellow closely over the top. I was trying to create a shadowed effect and I think it worked quite well. I ended up painting some freehand lines on the leave with black polish to give them some more depth. Because it's the middle of winter here, I just can't get to take any swatch photos in full sun. Stupid work and life keep using up all my daylight! This polish definitely looks more saturated when viewed in the full sun. 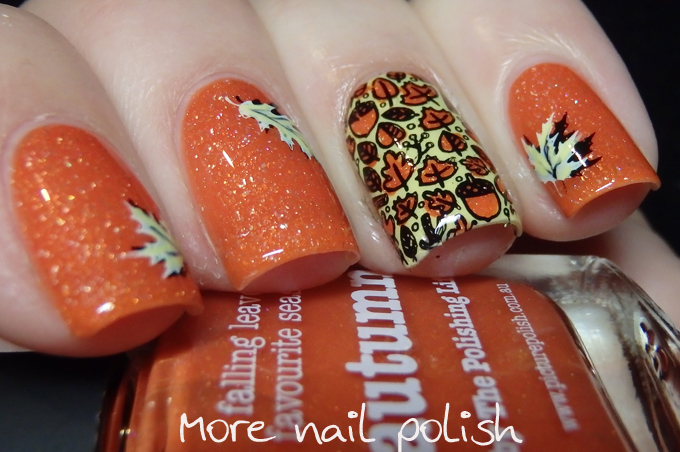 Picture Polish Autumn is available from Picture Polish. International ladies may be able purchase through one of the many Network stockists if they have this in stock. I am so happy that you like it! Gorgeous pictures! Wow I cann believe it's that time of year already. 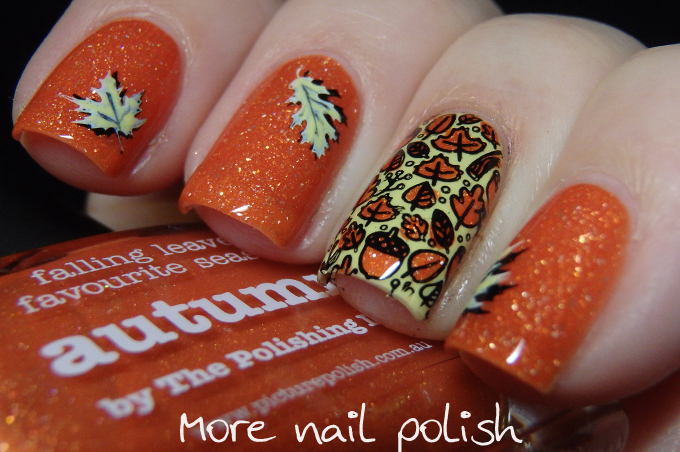 Love Autumn, it looks gorgeous and your manicure is so cute. That shadow effect is brilliant! I bet you start a new trend.